Definition at line 54 of file Record.h. Definition at line 57 of file Record.h. Definition at line 73 of file Record.h. Definition at line 60 of file Record.cpp. Referenced by llvm::RecordKeeper::addExtraGlobal(), llvm::Init::getAsUnquotedString(), llvm::RecordVal::getValue(), llvm::Record::isAnonymous(), and print(). Implemented in llvm::RecordRecTy, llvm::DagRecTy, llvm::ListRecTy, llvm::StringRecTy, llvm::IntRecTy, llvm::CodeRecTy, llvm::BitsRecTy, and llvm::BitRecTy. Referenced by llvm::BitsInit::allInComplete(), llvm::RecordRecTy::classes_end(), llvm::VarDefInit::classof(), llvm::UnOpInit::Fold(), llvm::CondOpInit::Fold(), llvm::StringRecTy::get(), llvm::DagRecTy::get(), llvm::DagInit::getArgNames(), llvm::Init::getAsUnquotedString(), llvm::VarBitInit::getBitNum(), llvm::VarListElementInit::getElementNum(), llvm::ListRecTy::getElementType(), llvm::ListInit::getElementType(), llvm::BitsRecTy::getNumBits(), llvm::UnOpInit::getOperand(), getRecTyKind(), llvm::BinOpInit::getRHS(), llvm::CondOpInit::getVals(), llvm::TernOpInit::isComplete(), llvm::FoldOpInit::isComplete(), llvm::IsAOpInit::isComplete(), llvm::IntInit::isConcrete(), llvm::DefInit::isConcrete(), print(), llvm::Init::print(), and QualifiedNameOfImplicitName(). Returns the type representing list<this>. Definition at line 63 of file Record.cpp. Referenced by llvm::ListRecTy::get(), print(), and llvm::resolveTypes(). Definition at line 76 of file Record.h. Referenced by llvm::BitRecTy::classof(), llvm::BitsRecTy::classof(), llvm::CodeRecTy::classof(), llvm::IntRecTy::classof(), llvm::StringRecTy::classof(), llvm::ListRecTy::classof(), llvm::DagRecTy::classof(), llvm::RecordRecTy::classof(), typeIsConvertibleTo(), llvm::BitRecTy::typeIsConvertibleTo(), llvm::BitsRecTy::typeIsConvertibleTo(), llvm::CodeRecTy::typeIsConvertibleTo(), llvm::IntRecTy::typeIsConvertibleTo(), and llvm::StringRecTy::typeIsConvertibleTo(). Definition at line 79 of file Record.h. References dump(), getAsString(), getListTy(), typeIsA(), and typeIsConvertibleTo(). Referenced by dump(), llvm::Init::dump(), llvm::RecordVal::getValue(), llvm::Record::isAnonymous(), and llvm::operator<<(). Reimplemented in llvm::RecordRecTy, llvm::ListRecTy, and llvm::BitsRecTy. Definition at line 74 of file Record.cpp. Referenced by llvm::RecordRecTy::classes_end(), llvm::TypedInit::convertInitializerTo(), llvm::UnOpInit::Fold(), llvm::TypedInit::getCastTo(), llvm::ListRecTy::getElementType(), llvm::BitsRecTy::getNumBits(), print(), and QualifiedNameOfImplicitName(). Reimplemented in llvm::RecordRecTy, llvm::ListRecTy, llvm::StringRecTy, llvm::IntRecTy, llvm::CodeRecTy, llvm::BitsRecTy, and llvm::BitRecTy. Definition at line 69 of file Record.cpp. 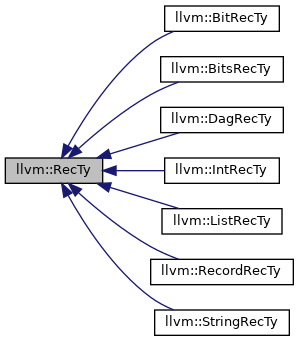 Referenced by llvm::RecordRecTy::classes_end(), llvm::DefInit::convertInitializerTo(), llvm::StringRecTy::get(), llvm::BitRecTy::getAsString(), llvm::CodeRecTy::getAsString(), llvm::IntRecTy::getAsString(), llvm::TypedInit::getCastTo(), llvm::ListRecTy::getElementType(), llvm::BitsRecTy::getNumBits(), print(), llvm::resolveTypes(), llvm::RecordRecTy::typeIsA(), llvm::BitRecTy::typeIsConvertibleTo(), and llvm::BitsRecTy::typeIsConvertibleTo().